Voice of the soil; voice of the street; voice of the soul, I’ll settle on the latter as the vocals are the first thing that knock you out when discovering the music of Charley Crockett. Their uniqueness coupled with the perfect fit for the style of songs is quite a find and set to acquire this Texan plenty of new admirers. LONESOME AS A SHADOW is the title of the latest release and tosses a virile mix of honky tonk country, blues and soul into the pan. Do not expect too much of your listening time taken as the album rattles through twelve tracks in thirty minutes, unless you succumb to the inevitable pull of repeat plays to double check what you have just heard is that good. 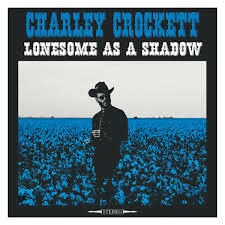 Charley is the veteran of a few albums now, including a devoted recent honky tonk one, but this latest effort signals a more international approach in promoting the artist. Live shows introduced him to UK audiences as the opening act for the JD McPherson tour at the start of 2018 with headline dates planned over here in the summer. First-hand reports from these, and shows on the Cayomo cruise, back up his credentials, but you get the unfiltered authentic feel from just listening to the records. A useful quality for selling your music in far-away lands. The backstory narrative does include the quintessential drifting lifestyle, and for someone with this surname, a heritage that traces back to the pioneering days of his namesake Davy. You get the impression that this sound and approach comes direct from the DNA and not some finishing school, although you could say the streets, honky tonks and bars are the best musical educational establishments. Apart from his Texas home, visions of anywhere in the south-west gateway states of Louisiana, Arkansas or Oklahoma conjure up from listening, leading to possible descriptions like red dirt soul rinsed in country blues. While the aura and voice leave the strongest marks, there are a couple of tracks that warrant a mention. The throwback honky tonk number ‘Goin’ Back to Texas’ is a riveting hip mover in the final throes of the record and doubles up on the country front with the steel-driven traditional piece ‘The Sky’d Become Teardrops’. However, a soulful sound generally takes root as exemplified in the funk ‘n’ groove brass infused ‘Sad and Blue’, a song title that requires no further explanation. A tilted rock ‘n’ pop retro sound makes ‘Lil Girl’s Name’ resonate, in a similar vein to the way the organ floats neatly to the ear in ‘Help Me Georgia’. All good albums benefit from being suitably bookended. The emotive and subtle opener ‘I Wanna Cry’ does the business out the traps and the acoustic vibes of ‘Change Yo Mind’ does likewise for the finale. Throughout the album, a vibrant zone is easily located making this a record that you will enthusiastically want to share.